Founded in 2002, Rosewood's Horse Therapy Program is certified by the Professional Association of Therapeutic Horsemanship International. Located at the Rosewood Ranch near Pawnee Rock, Kansas, the program provides the opportunity for clients to work, ride and enjoy horses in a beautiful country setting. Rosewood Ranch provides a unique place for individuals to enhance self-awareness and self-esteem, as well as set, meet and exceed goals. Individuals involved in the Horse Therapy program are actively involved in the life of the Ranch, including naming the various foals born each year. 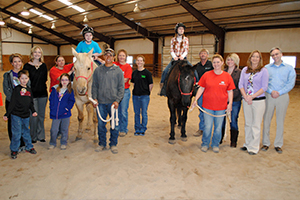 It employs a full-time PATH International instructors in addition to full-time ranch staff. The Ranch also serves as a “home away from home” for individuals during various recreational activities, parties and other events. Participants work weekly to perfect their riding skills in preparation for the Rosewood Rodeo, held each year in October. The Rodeo showcases the remarkable strides each person has made throughout the year. The Rodeo is a wonderful time to celebrate achievement in various events, including Horsemanship, Flags, Keyhole Races, Barrels, Pole Bending and Trail Competition. Hammond and his staff of experienced instructors help riders hone their skills year round. Riders really shine in competitions and members of our Advanced Class are earning top honors in events such as the NSBA World Championship and sponsored events by the American Quarter Horse Association (AQHA), Kansas Quarter Horse Association (KQHA) and the South Central Stock Horse Association (SCSHA). Clients also work weekly to perfect their riding skills in preparation for the Rosewood Rodeo, held each year in October. The Rodeo is a wonderful time of celebration for the achievements of clients in various events, including Horsemanship, Flags, Keyhole Races, Barrels, Pole Bending and Trail Competition.